Wearing gloves while preparing ready to eat foods (RTE) reduces food borne illness spread and shows the consumer your restaurant cares about food safety. In my last blog, I wrote about the importance of hand washing. Our hands carry germs. Some of those germs cause food borne illness. No matter how much we wash our hands they are not sterile. Some germs remain. Proper gloves can help keep those germs of the food prep. As a physician, I would never allow a surgeon to operate on me without wearing gloves. Why should we eat food prepared or served without wearing gloves? The food safety image of a restaurant is tarnished if a food preparer doesn’t wear gloves when serving RTE foods. How do you feel when you notice a cook or server is touching your RTE food without wearing gloves? A turn off, isn’t it? It also increases the risk of transmitting disease. Imagine a dentist putting his/her hands in your mouth without wearing gloves. Would you ask him/her to put on gloves? When food service workers touch RTE foods without wearing gloves, is literally like putting their fingers into the customer’s mouth. Just like dentists, food service workers are entrusted with the public health. 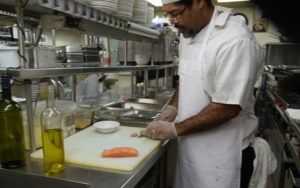 Wearing gloves when preparing RTE foods is critically important to reducing food borne illness. The Critical FDA Food Code item #9 associated with an increased risk of food borne illness is failure to use gloves when preparing ready to eat foods (RTE). Are food preparers or food servers required to wear gloves? Yes, and maybe. It is an FDA Food Code critical violation for a food preparer or server to touch RTE foods with bare hands. Wearing gloves meets the national standard, considered best practice in reducing the spread of disease. Unfortunately, not all states enforce this standard. Not all food preparers and or servers conscientiously comply. From the CDC report mentioned above, it can be inferred that any protective glove barrier will help. But not all gloves are equal. A topic worthy of next week’s blog post. As a physician for over 40 years, I know that wearing gloves is one way of preventing spread of disease. It is an expected standard when health care workers examine patients. It is also an expected standard and best practice when food service workers touch RTE food. Variance from that standard blemishes a food safety image. In reviewing our Dining Grades database of over 4 million health department scores and hundreds of thousands of violations, we have discovered national trends. Failure in wearing gloves when preparing ready to eat foods is a top trending violation. Attention to education about the critical importance of wearing gloves when preparing RTE foods reduces food borne illness risk, reduces the potential of a tarnished food safety image and reduces the probability of health inspection violation.